The key difference between compressed natural gas (CNG) vehicles and vehicles of other fuel types is that the former stores fuel on board under high pressure. A full CNG cylinder typically has fuel stored between 200 and 250 bar (20,000 and 25,000 kPaor 3,000 and 3,600 psia). Just as with other fuels, this requires a level of understanding and respect. Existing industry standards already require additional precautions for CNG vehicles. Adherence has helped give the natural gas vehicle (NGV) industry an exceptional track record for safety to date, especially when compared to other fuel types. Unfortunately, and also as for other fuels, there are some people who choose to take unnecessary risks; their actions diminish the safety threshold and demonstrate a lack of knowledge and disregard for correct procedures. While this problem is not isolated to NGV operators, the introduction of a point-of-refuelling control measure can prevent gas being dispensed into unsafe vehicles or those not designed for natural gas. Point-of-refuelling is the critical point of control in the CNG fuel chain, where control can be implemented before high pressure gas is dispensed into the vehicle. The control methodology hinges upon various forms of verification. The goal of verification is to identify an irregularity on a CNG vehicle and to prevent gas from being dispensed until the irregularity is rectified. The irregularity might be that the vehicle does not have current inspection requirements; or it may have been tampered with since its most recent inspection; or it may have had a mechanical fault since its most recent inspection. 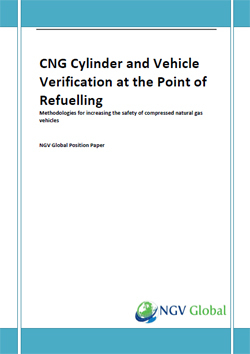 NGV Global has published a Position Paper which examines the issues of CNG vehicle and cylinder verification and proposes recommendations for industry consideration. The paper, “CNG Cylinder and Vehicle Verification at the Point of Refuelling – Methodologies for increasing the safety of compressed natural gas vehicles” can be downloaded at no cost by entering your details in the box below. Once submitted, a download link will be made available on the following page.